New septic going in before closing. Cool Hollow House is on the Maryland Register of Historic Properties, and the closing process required a little more work than a non-historic home due to this. The bank was requiring work be done to the property immediately as a stipulation to close. Peeling paint was to be remedied on the 80 plus year old standing seam metal roof, exterior walls, and interior woodwork, some electrical issues needed to be fixed, and flooring needed to be replaced on the first floor in the north wing. The largest ticket item, which luckily a thorough inspection found (always pay for the inspection, its about $500 out of your own pocket, but well worth it) was the collapsed septic tank, which we thankfully were able to get the seller to pay for. This required an enormous amount of excavation, new plumbing, and after repair to the lawn and gardens. After the Historic Trust approved the work that was needed we were able to close, and were given 30 days to get the work completed. After this initial work was done we started in earnest to search for contractors to help us start on the journey that we had been dreaming of since we stepped foot in the place months before. 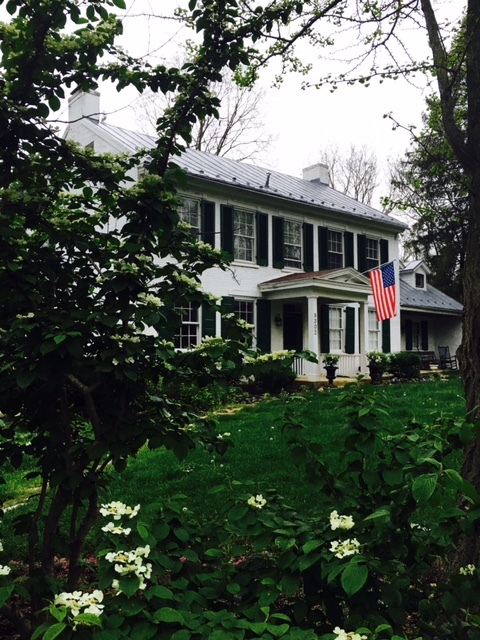 Early spring 2016, with blossoms, note the newly painted metal roof. I had mentioned in the introduction post that I am an Interior Designer, so we had a good start to what we were looking to accomplish. It is important to set a plan in motion if you are looking for a cohesive result. We started before the closing to do research on the federal era to try and choose colors that spoke to that time. We decided on the Sherwin-Williams historic color palette to use as a base. Knowing that we wanted to give a nod to the past, we also desired to live in a house that spoke to the fact that we are couple of the modern age, and didn’t want to feel as if we were living in a museum. Finding a local contractor that we were comfortable with, we bounced ideas off of each other as we started to brainstorm. It is important to note that the house needed everything. And I mean everything. The only work that had been done was a new furnace and hot water tank. The previous owner had tried to get the house zoned for a bed and breakfast, and camping ground. Luckily, the county would not agree to the plan, and the house subsequently went up for sale (and we bought it). Floors were in disrepair, ceilings were cracked, the kitchen and bathrooms were over 40 years old, water damage from a leak in the roof had caused mold, and the wallpaper looked like something out of the Brady Bunch. I began the design process with doing hand rendered drawings of the rooms, with the colors that we had selected to get a visual representation of what the rooms were to look like. The first room we decided to tackle was the large formal parlor, which we affectionately decided to call “the salon”. Wanting to preserve as much of the old plaster walls as we could we removed the old grass cloth wallpaper, and began patching the walls where damage had occurred. The ceiling had unfortunately been damaged beyond repair, so we designed a reverse tray that created a wonderful shadow around the edge, and heavy crown molding with picture rail. The room retained its original chair rail, and we decided to add molding below it to give the illusion of paneling. The floors in this room fortunately were in remarkably good condition only requiring cleaning and waxing. The floors throughout the house are the original wide heart of pine. As mentioned we did save the plaster on the walls, however all you old house owners will relate to the fact that even though solid, at nearly 200 years, the walls have bumps, and imperfections. So we decided that the paint on the walls would need to be a flat sheen to help soak up the reflections that these would make. We chose Sherwin-Williams Classic French Grey for the walls, and Sherwin-Williams Incredible White for the trim. Throughout our travels we had acquired some good pieces of furniture, and the gold fabrics that we had the Baker sofa and antique European wing back chairs upholstered in coordinated perfectly. Custom wooden valance boxes were built to hide the drapery mechanism. The drapes themselves were custom made in a gold with an organic French grey pattern embroidered on them. A palace size wool rug found at a local auction house in light blues, greys, and rose went on the floor. Salon during first viewing: December 2014, and Salon as it appears today. It is important to mention that simultaneously during the interior renovations that we also were paying much detail to the more than 4 acres of lawn (3 acres are wooded) and mature gardens that came along with the house. I will discuss the exterior work in future posts. I am going to try to keep chronological order to this blog so everyone can follow the progression of Cool Hollow House as we experienced it.